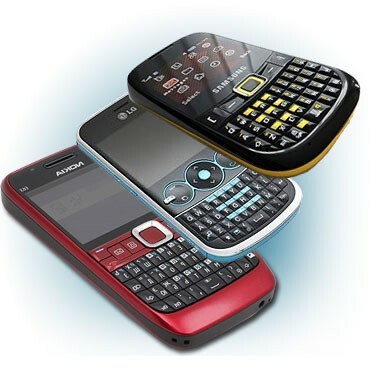 Rediff.com » Business » Number portability: Telcos offer special plans! 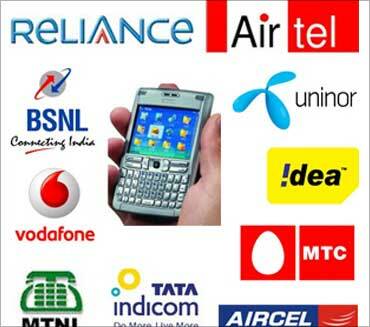 Number portability: Telcos offer special plans! Ushering in a new and consumer friendly regime in the sector, Prime Minister Manmohan Singh on Thursday flagged off nation-wide Mobile Number Portability, a service that allows subscribers to change service provider while retaining the number. This would benefit over 700 million subscribers, both in GSM and CDMA categories in the country. The new policy would force the operators to shift focus from acquiring new subscribers to retaining the existing ones. All that a customer needs to do for changing his telecom operator is pay a maximum of Rs 19. 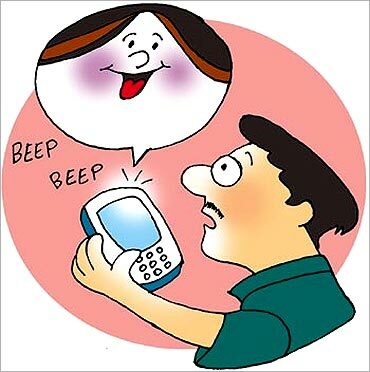 He/she will get a new service provider within seven working days as per the guidelines of regulator TRAI. Image: Prime Minister Manmohan Singh launching the Mobile Number Portability across India. "Till now, operators were competing to acquire new subscribers. But launch of MNP will force them to offer innovative and quality services to retain their subscribers," Singh said. 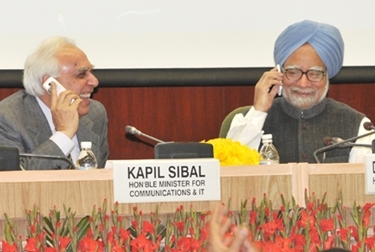 The Prime Minister marked the launch of the service by making a call to Telecom Minister Kapil Sibal who was seated next to him. MNP services were first launched in Haryana in November last year and according to industry estimates, less than one per cent subscribers opted for changing their operators. The Prime Minister said the telecom sector acts as a catalyst for growth of other sectors of the economy. "Today's development -- launch of MNP -- will go a long way in enhancing customer's satisfaction," he added. With monthly addition of 15 million subscribers, India has achieved a teledensity of 65 per cent. The Indian telecom sector, which is the fastest growing in the world with the lowest tariffs, has grown from 33 million in March 2004 to about 750 million now. Telecom operators have welcomed the launch of MNP services, stating that the move will "liberate" subscribers from non-performing service providers. Describing subscriber as a king, Sibal said the service would offer wide choice to customers. 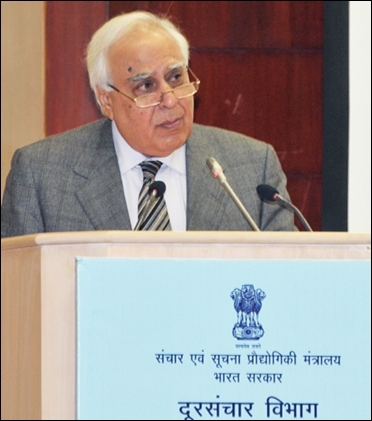 Image: Union Minister for Information Technology Kapil Sibal. "MNP will compel service providers to offer innovative, affordable and competitive tariff plans for the benefit of the masses," he said. The minister said the operators will have to make substantial investments in network, technology and processes to ensure continuous improvement of their "Quality of Service". Though India has introduced MNP relatively late vis-a-vis other developed countries but at the same time it has been done by adopting the latest technology and methodology. As of now the MNP services would be available within a circle, Sibal said. Image: A schoolboy uses his cell phone to take a picture of classmates hanging onto cement roots at Nek Chand's Rock Garden in Chandigarh. MNP, the consumer-friendly service, was mooted over two years ago and was supposed to be implemented by the end of 2009. However, the schedule for implementation had to be deferred several times, owing to reasons ranging from the lack of preparedness of operators to delays in the appointment of an agency to oversee execution of the MNP project. Customers will have to pay a maximum of Rs 19 to an operator to change their network and the new operator has the option to either waive the fee or reduce it. 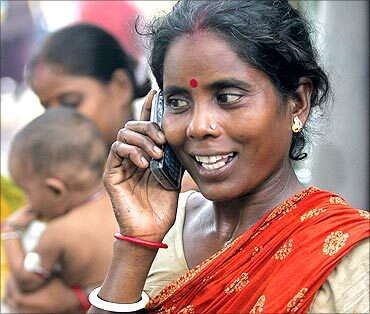 Image: Tulsi Prasad, an Indian slum dweller, uses a mobile phone. However, a consumer will have to remain with one operator for a minimum period of three months in order to avail the MNP service. Both pre-paid and post-paid consumers can use MNP. The new option will bring about a much required change in the quality of services, as well as attitude of operators towards redressal of grievances in order to retain subscribers. As per the eligibility criteria for MNP, customers must have cleared all their outstanding bills before making an application, as per the Department of Telecom (DoT). 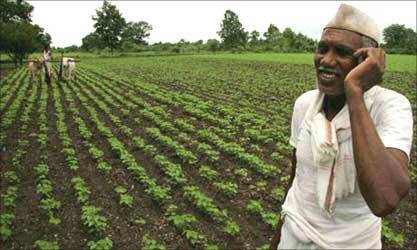 Image: A farmer talks on his phone. It has also said the mobile number sought to be ported should not be sub judice and there should not be any pending request for change of ownership of the mobile number. The DoT has claimed that the entire process of switching operators will take a maximum of seven days and subscribers may face disruption of services for about two hours during that period. The one-time charge that needs to be paid by subscribers would differ from operator-to-operator, but the charge cannot exceed Rs 19. Image: People sit in a flooded phone booth at a bus station after heavy rains in New Delhi. Following the launch of mobile number portability (MNP), telecom operators like BSNL and MTS announced various schemes to woo subscribers of other companies. State-owned BSNL will provide free 2G and 3G connections, besides free talktime to MNP customers migrating to BSNL. 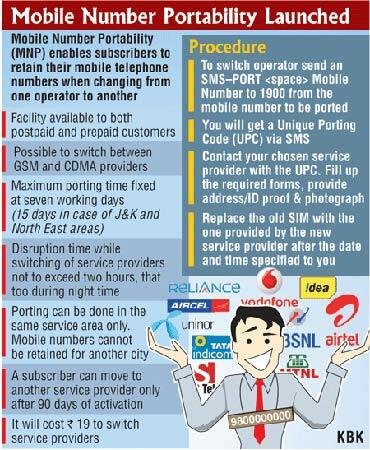 "No port in charges shall be levied to customers moving to BSNL. Besides this, the SIM card for 2G/3G shall be provided free of cost, along with an additional talk value of Rs 100 for prepaid customers," BSNL said in a statement. Image: You can choose any operator. Subscribers will also get 50 per cent rebate on the first month charges along with free 5 GB GPRS/3G usage for a month. MNP has not only ushered in fresh competition among GSM operators, but between GSM and CDMA operators as well. Sistema Shyam Teleservices Ltd (SSTL), which offers CDMA services under MTS brand name, said it will offer a range of smartphones through easy monthly instalment (EMI) options, along with free talktime. Besides, CDMA customers switching to MTS would be offered half paisa per second tariff for all local calls valid for three months on buying the first recharge coupon of Rs 13. 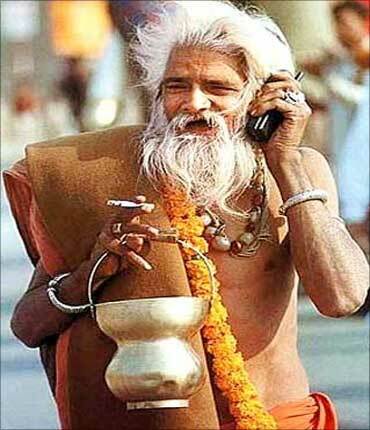 Image: A sadhu speaks on his phone at Kumbh Mela. Photographs: Courtesy, World Wide Web Consortium. Apart from wooing new customers, telcos are also launching innovative schemes to retain existing customers. Loop Mobile, which operates in Mumbai, has launched a new offer under which its subscribers will get minimum 0.50 paise per minute for every call drop in Mumbai and Thane. Customers will have to pay a maximum of Rs 19 to their existing operators to change their networks and new operators have the option to either waive the fee or reduce it. However, a consumer will have to remain with one operator for a minimum of three months, for availing the MNP service. 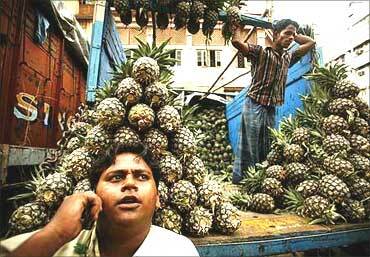 Image: A pineapple fruit seller in Kolkata speaks on a mobile phone. Uninor, the JV company between Norwegian firm Telenor and Unitech, said the company will go with its Dynamic Pricing scheme to attract pre-paid subscribers to its network. "The customer can keep the same number but start getting up to 60 per cent discounts on all the calls that is a powerful proposition," Uninor said. The Department of Telecommunications has said the entire process of switching operators will take a maximum of seven days and subscribers may face disruption of services for about two hours during that period. 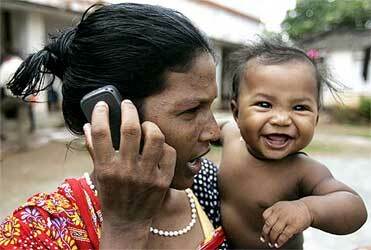 Image: A woman speaks on a mobile phone at a refugee camp in Bhubaneswar, Orissa. The nationwide roll-out of Mobile Number Portability is likely to prompt 6-7 per cent of existing users to switch to other operators, say analysts. However, after the first few months, the churn rate will stabilise as operators improve their networks to retain existing subscribers. "For the first 3-6 months, we might see the churn going up to 6-7 per cent from the current level of about 4 per cent per month, as people who want to change their operator will do so in the first few months. But later, it will stabilise," Ernst & Young (E&Y) Partner and Telecom Industry Leader Prashant Singhal told PTI. 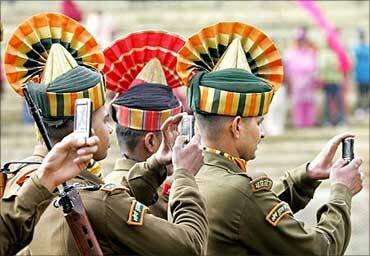 Image: Ceremonially dressed soldiers in Srinagar, Kashmir, record the Republic Day celebrations. Subscribers across the country have been waiting for the roll-out of MNP to switch to other operators. Customers will have to pay a maximum of Rs 19 to an operator to change their network while retaining their existing phone numbers and the new operator has the option to either waive the fee or reduce it. However, a consumer will be required to continue with an operator for a minimum period of three months in order to avail the MNP service. 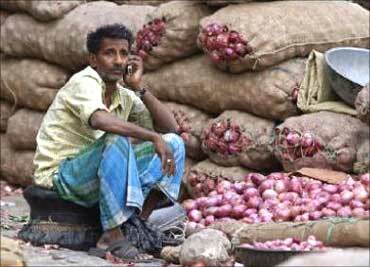 Image: An onion vendor speaks on his mobile phone. "We don't see a major impact of MNP. People will change their operator if they face problems in network coverage, quality of service, customer care and not so much for pricing, because today, almost everyone is offering similar tariff plans," KPMG Head of Telecom Romal Shetty told PTI. However, it is offerings like 3G and other value-added services that will help operators differentiate themselves from the rest of the pack, he said. Image: People will change their operator if they face problems in network. "3G licenses have been bagged by specific players. So customers looking for 3G services would move to an operator offering 3G," Shetty said. Gartner Principal Research Analyst Kamlesh Bhatia was of the view that the scales could tilt in favour of major players. "The focus would be on customer experience and so the scales could tilt in favour of the bigger players," he said. 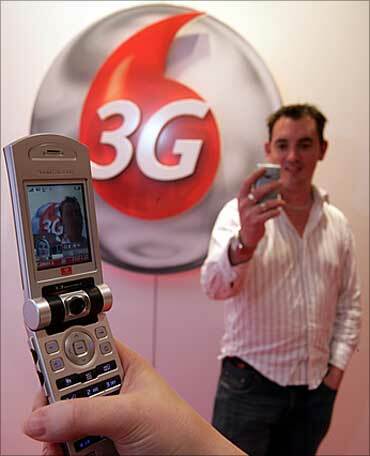 Image: 3G to be a deciding factor. Analysts feel that while MNP is unlikely to make a huge difference to the balance sheets of telecom operators, the story could be different if high-usage customers jump ship. "Though companies are not expected to reduce tariffs, since they are already bleeding, we could see very focused initiatives like discounts and freebies for high usage customers to prevent them from switching," Deloitte Haskins & Sells Partner Hemant Joshi said. Image: More discounts and freebies to users.